A sturdy and robust gents sterling silver Celtic band. This durable Celtic band is made from sterling silver which is then oxidised to give it a blackened appearance. The ring has Irish text running along the exterior of the band that says “Mo Anam Cara” which means “My Soul Mate” in Irish. 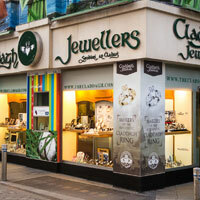 A beautiful Claddagh emblem sits at the end of the text. This beautiful Celtic band would be the perfect gift for someone you love. 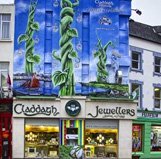 Claddagh Jewellers – The Celtic Jewellery Specialists - From Galway with Love.